PACKERSHOME » Lambeau Field » Around The NFL » Lions and Vikings and Bears, Oh My ! What's in your gun-sight ? That's right pilgram, GB is favored to win the 2015 Super Bowl ! You got a problem with that ? Wow....making fun of those less fortunate. Lions getting killed and going 0-5, Nate Burleson on NFL Network picked them to unseat the Packers. I saw this as well - also had a great laugh on that one. Minnesota is the only other team that seems to be showing up in the division. The bares won today, but it was against a very banged up team - nothing to hang their hat on. Hey Moe, I built a Lion cage. Put em up, put em up . The Vikings look for real this season. They lose their starting QB, then Adrian Peterson, and don't miss a beat. Sad to say, this might be their year. 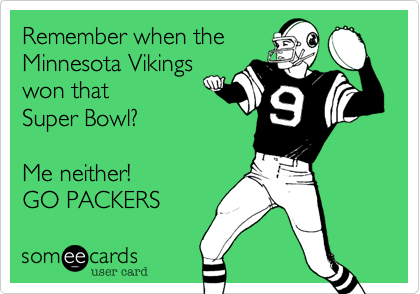 Wow....the Vikings looked so good, like they were going to blow away the division. Now here we are, with the LIONS in 1st place, and the Vikings tied with us. I was SOOOO hoping for the Lions to lose yesterday. I was bummed when they didn't. We are going to need some serious help to win the division now. road sign.jpg (38kb) downloaded 0 time(s). Bears Stomp.jpg (309kb) downloaded 9 time(s).